Title from spine, uniform title from accompanying notes. Manuscript, written on vellum and paper. Vellum used on the following leaves: 1-3, 5, 7-8, 10, 12-15, 20-21, 26-27, 34-35, 42-43, 50-51, and 58. Astronomical illustrations on leaf 61 (recto and verso), 62v, 63v, 64r, and 66v. Space provided for illustrations on 68v and 71v, but left blank. The Grosseteste Commentary was printed at Venice 1514. The present text is complete but the chapter numbering differs, e.g. lib. 1, cap. 9 begins 12v, line 21 and the cap. 9 of 13v is really cap. 10 of the printed text. Two blanks on 20 and 25v are filled by the words "lineas rectas" and "ventum" respectively. Aristotle's text is not given. The "Theorica Astronomie", though beginning with the same words as the book by Gerard of Saibonetta and often printed, is by Walter Brit (fl. 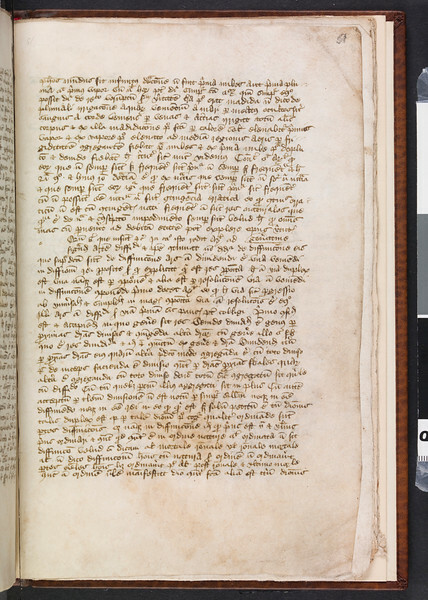 1390), according to two Oxford Mss., (Digby XV f. 58v-92 and Wood 8 d. f. 93), or by Simon of Bredon (Digby xlviii f. 112v), both fellows of Merton. Other copies of this tract are in the British Museum, e.g. ms. Eg. 889 and Eg. 847. The diagrams omitted may be completed from the former manuscript. This work is unpublished. Contents: 1. Omnis doctrina et omnis... Intentio Aristotelis in hoc libro... -- 35r. Explicit primus liber posteriorum secundum expositionem domini Lyncolniensis -- 35v. Questiones sunt equales... Scita sunt quatuor secundum genera... 60r. (des.) in omni silogismo similiter se habente -- 61r. (inc.) Circulus ecentricus et circulus egresse cupsidis et circulus egrediens centri idem sunt. Est autem quilibet... 72v. Explicit theorica astronomie.